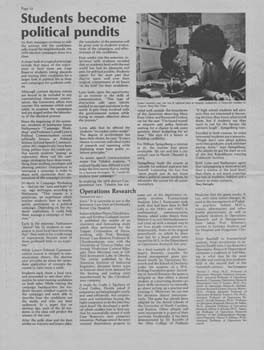 For the eleven students enrolled in POSC 323, the 1976 elections were not just an academic exercise. James Nathansons Political Science class, Campaign Workshop, required students to participate in and write about a local political campaign. Students explored the structure of political debate and campaigns, the role of professional campaign organizations, and political fund raising. Two classes had students get involved with real political races. 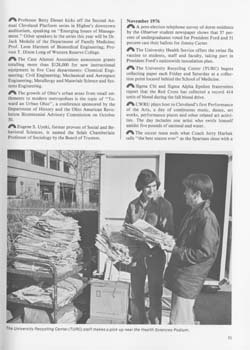 As reported in the University's 1976/1977 Annual Report (left), students preferred Gerald Ford to Jimmy Carter in a telephone survey (right).